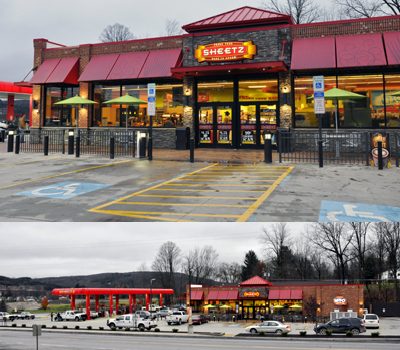 Sheetz, Inc. is one of America’s fastest growing family-owned and operated convenience store chains, with more than $4.5 billion in revenue for 2010 and more than 14,500 employees. The company operates more than 395 convenience locations throughout Pennsylvania, West Virginia, Maryland, Virginia, Ohio and North Carolina. In May 2010 MBC purchased the vacant and unused Farmer in the Dell restaurant, sited on a 1.6 acre parcel on Route 6 in Mansfield Pa., in order to build and lease back a 5,700 square foot Sheetz convenience store with fueling facility featuring five fueling docks. The old building was knocked down and a new building was erected on the site. The new store opened to the public in September 2011.